Destiny's second DLC called "House of Wolves" (HoW) features a similar number of Exotic weapons and armour as the collection which came packaged with The Dark Below. An Exotic shotgun called the Lord of Wolves and the 347 Vesta Dynasty scout rifle make their first appearance in this DLC along with nine exotic armour pieces. Unlike Raid weapons and armour, Exotic gear can be earned through Nightfall rewards, Legendary Engrams, Prison of Elders rewards and chests, and most importantly - bought from Xur! But as more Exotics enter the game the chance of finding DLC Exotics diminishes making it even more important to understand the full range before parting with any Strange Coins. House of Wolves lends generously towards Warlocks this time around. Sunsingers and Voidwalkers get their chance to earn some useful Exotics in the shape of The Ram and Nothing Manacles. Striker Titan's get all three Exotic pieces promoting even more smashing of fists! Hunters have the questionable Exotics in this DLC and only time will tell how useful they turn out to be. Special Perk: Resolute - Provides Unstoppable for Fist of Havoc. This Titan Helmet is aimed squarely at the Striker class thanks to it's upgrade perks of Rain Blows and Resolute. Resolute in particular will reduce damage during the Fist of Havoc power slam making your Striker Titan immune to damage. Although not an amazing perk, it does come in handy when smashing groups of exploding enemies such as Thralls or when you're in the direct line of a Captains Shrapnel Launcher. Special Perk: Strength of the Ram - increased armour and all Voidwalker melee hits trigger life steal. This ones aimed squarely at the underused Voidwalker class. It's basic perks called Infusion and Scholars Draw provide players with replenished health for picking up Orbs and bonus Super energy for killing an enemy with melee. 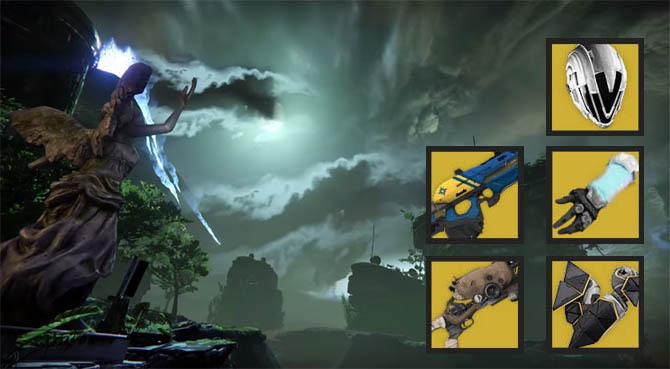 But of course the final and obviously best perk for The Ram is Strength of the Ram which provides a guaranteed Life Steal every time you connect with a melee hit (in the Voidwalker class). For those unfamiliar with Life Steal this little baby grants the player an immediate health top up and a few seconds of health regen. Thus by using The Ram, Voidwalkers who have spent far too long blasting Nova Bombs from distance will have the confidence to go in for melee attacks like their Titan cousins. This Hunter Helmet plays into the hands of both Bladedancers and Gunslinger's. I'm a little sceptical how good it's special perk is going to be though. Angel Hunter will increase your weapons accuracy for a short time after jumping which sounds rather dull but does it mean that you're more likely to get head shots after jumping or just that your gun becomes more stable? If it's the former then guaranteed headshots would make this armour piece an interesting asset for Hunters. Special Perk: Wrath Conductors - deal damage when under melee attack. Another great Titan Exotic, perfectly suited to those who love smashing things with their fists! Not only do these Exotic gauntlets come with Rain Blows (which increases melee attack speed) but coming under melee attack yourself will immediately deal damage in the nearby area. The exact strength of this damage isn't huge but is still welcome in a direct fist fight. Special Perk: Burn Brighter - disorient enemies after using Radiance. Another exciting Warlock Exotic which makes you think that Bungie are trying to improve on the Warlocks dismal past. This Exotic chest piece contains two perks which work in tandem: Serpent's Mouth and Serpent's Tail will reduce the cool down of your grenade from melee attacks and vice versa your melee cool down will reduce from grenades. But ultimately the best perk for this exotic chest piece is the Burn Brighter perk which was stolen from The Ram exotic just before House of Wolves released. Burn Brighter is the perfect compliment for those Sunsinger Guardians who love to keep the Super in their back pocket for unexpected deaths. As all Warlocks know, Radiance is an amazing ability but when surrounded by enemies you can easily get trapped or meleed to death again very quickly. The Burn Brighter perk will disorient nearby enemies when Radiance is activated from the grave. Much like the Helmet of Saint-14 which blinds enemies within the Titan bubble this perk will buy you and your team some time to regain control. Special Perk: Touch of Venom - hitting an enemy with melee whilst invisible will inflict damage over time. A brightly coloured and strange looking Gauntlet piece, the Ikaheka's Hooks have a rather interesting special perk. When invisible Hunters can cause damage over time to an enemy simply by using their melee attack. The immediate use for this seems to point to a stalker attack whereby invisible Hunter's creep up to a boss, take a melee attack unaware and silently creep out again. As long as the damage over time is considerable enough then this Exotic piece will be high on the list for Hunters. Special Perk: Peregrine Strike - shoulder charge deals bonus damage when activated in the air. Catering to a really specific situation, these Titan boots seem to be a kamikaze special. Anyone brave enough to shoulder charge through the air will receive bonus damage against their enemies. In my opinion this seems like something you'd rarely use unless you're out for fun so I'm not convinced this Exotic will be high up the list. Special Perk: The Cold Equation - kills with Void Light grant a shield. At last a good Warlock exotic which caters to the Voidwalker subclass. Nothing Manacles offers a bonus shield whenever you gain kills with Void Light. Void Light kills come from both the Void Super and also the Axion Bolt grenade, giving you two avenues for earning a welcome shield. Comparable to the Sunsinger flame shield but with a better advantage in my opinion of not requiring you to get up close for melee attacks. Update Post-DLC Bungie have nerfed this exotic and it no longer includes the The Cold Equation perk (shield). Instead, the unique perk was changed to Scatter Charge - Scatter Grenades have a tracking ability. This makes Nothing Manacles less desirable than before. Another Hunter Exotic with a questionable Special Perk. Hunters already have a Triple Jump skill so what will the "Not Bound by Law" perk add to the equation? Well, Triple Jump does provide Hunters with the ability to jump three times which is great for venturing across long horizontal chasms but not so good at reaching great heights. This perk will probably be more like the Higher Jump ability, allowing players to reach great vertical heights. With that said, do we really want to occupy an Exotic slot just for this? Probably not. Special perks: Unknown at this stage but the base perk guarantees that Dreg's Promise always comes with a full ammo clip upon respawn. 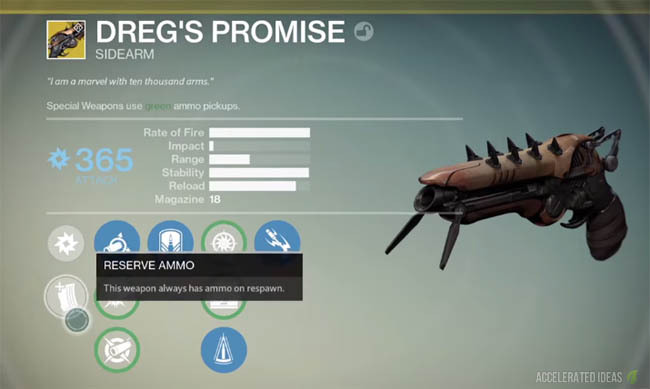 Dreg's Promise is a new weapon type entirely - known as a Sidearm. Bungie managed to keep this sucker a secret right up to the House of Wolves reveal trailer, just one week before launch! This arc damage weapon has an incredibly high Rate of Fire, Stability and Reload rating but is compensated by a relatively weak Impact rating. This is the norm for Sidearms which make their first appearance in the House of Wolves DLC. It also consumes the Special weapon slot along with Fusion Rifles, Shotguns and Sniper Rifles. The first of the Exotic weapons included in the House of Wolves DLC, this kinetic scout rifle has two aptly named perks called David and Goliath. If you remember back to the biblical story, David was a small but quick opponent who used an accurate sling whereas Goliath was a huge opponent that relied heavily on his armour and shield. Bungie have translated this meaning to the game though the two perks. The Goliath perk grants the player an increase to Armour for 15 seconds for non-precision kills whilst the David perk gives the player an increase to Agility for 15 seconds for precision kills. Shotguns may not be the most popular guns in PvE but they certainly have their place in PvP. This unique Exotic weapon called Lord of Wolves (which may be a Prison of Elders Exotic) has a rather interesting special perk called Devil's Touch - successfully gaining several hits has the chance to set your opponent on fire causing damage over time (DoT). Whether this proves more useful in PvP or PvE remains to be seen. A cross between a Fusion Rifle and a Sniper Rifle, this exotic weapon was a late edition to the House of Wolves DLC. Looking very futuristic, the sniper comes with two scopes; "Combat Sights" for close range and quick charge time, and "Marksmans Sights" for long range and standard fusion charge time. Both of these sights are selectable through the weapons perk tree. Unfortunately, the Queenbreakers Bow still behaves like a standard fusion rifle: requiring a lengthy charge time before a shot is fired. Unless you're skillful enough to scope and predict enemy movement, the charge time can easily result in missed shots from long range. Besides the cool looking scopes the weapon does come with Arc damage and a hefty chunk of ammo (up to 80 bullets from spawn). These features may be enough to convince players to bring the Queenbreakers Bow along for Arc damage Nightfall's and PVP matches where special ammo is in short supply. Special Perks: Dual scopes and the "Hidden Hand" perk provides improved target acquisition.